As the 2018 iHeartRadio Music Awards came to an end on Sunday night (March 11), one of the last awards given was for the Hip-Hop Song of the Year. The honor went to DJ Khaled for his summer banger “Wild Thoughts” featuring Rihanna and Bryson Tiller. “Wild Thoughts,” which appeared on Khaled’s 10th studio album Grateful, peaked at No. 2 on the Billboard Hot 100 and went three times platinum. The track was also a contender for Song of the Year Award and Best Collaboration at the iHeartRadio Music Awards, which DJ Khaled also co-hosted with Hailey Baldwin. Though he lost in those categories, he still walked away a winner at the awards show. 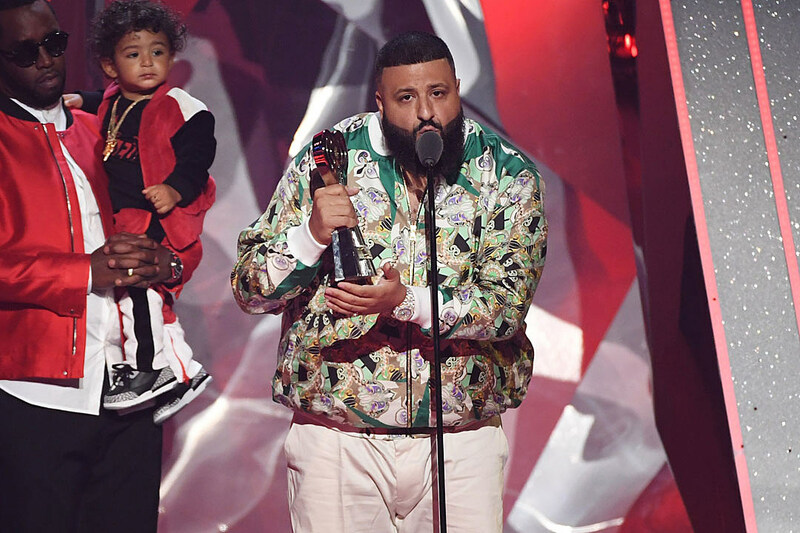 DJ Khaled took the stage to accept the award for Hip-Hop Song of the Year with his son Asahd, who was cradled by Diddy as Khaled thanked his fans. The DJ is big on fatherhood and recently announced that his next album will be titled Father of Asahd. “First of all, God is the greatest,” Khaled said as he took the stage. He then went on to shout out Rihanna and Bryson Tiller, before mentioning more projects he recently released, such as “Top Off” featuring Future, Jay-Z and Beyonce. “On everything I love, I will never stop. I ain’t gon’ stop, I ain’t never stopping,” Khaled continued. “Wild Thoughts” was undoubtedly one of the biggest songs in 2017, but was up against some some more recent jams that have shot up the charts. Other nominations included “Bad and Boujee” by Migos featuring Lil Uzi Vert, “Bodak Yellow” by Cardi B, “HUMBLE.” by Kendrick Lamar and “Rockstar” by Post Malone. The night was also a success for Cardi B and Kendrick Lamar, who both picked up awards.